1) Children were forced to take TCAPs and End of Course exams soon after their communities were ravaged by storms and tornadoes. It doesn't take a genius to figure out that their scores are not going to truly reflect what these children are capable of doing. 2) There were errors discovered on the 4th grade math TCAP test and in TCAPpractice booklets. Where there is smoke, there is fire. 3) Several parents have asked the TDOE to see copies of the TCAP tests their children took--all requests have been denied even though we have yet to find a law that prohibits us, as parents, from seeing this test. Transparency anyone? 4) Just yesterday, the Tennessee Department of Education (TDOE) informed districts that they will not have the TCAP "quick scores" back in time for districts to include them in grade calculations on final report cards! The scores, by law, make up 15-25%of a child's final semester grades and teachers use the percentage of problems correct (i.e., quick scores) on the TCAP to determine the semester grades. 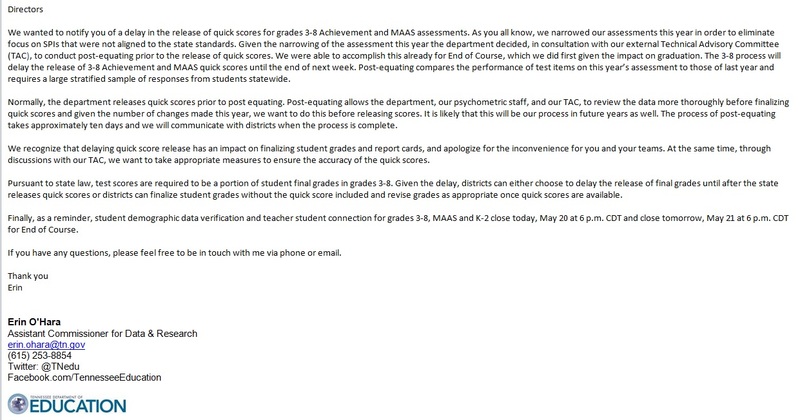 We have obtained a copy of the letter the TDOE sent to the state's school district directors and, from what we can tell, the TDOE is supposedly conducting a statistical analysis (i.e., "post-equating") on the quick scores and that is why the scores will be delayed. (According to the letter, in the past they they conducted post-equating after the quick scores were released and that is why they were able to get the scores out earlier.) Even though the TDOE suggested that districts delay the release of final grades, some districts are applying for waivers from the TDOE, asking that their student's TCAP scores not be included in their grades. It remains to be seen if the TDOE will honor these requests. When did you decide to make this change? Why were districts told at the last minute about this change? What about the districts that don't get waivers? Are their teachers supposed to come back to work during summer vacation to complete final grades? And last, but not least, would you allow a group of independent, 3rd party statisticians, testing experts, and parents to be a part of the current "post-equating" process so we can be assured that you are not attempting to manipulate the very scores that may affect our children's grades and definitely will affect their teachers' evaluations? We appreciate all that you did to help protect our children, their teachers, and their schools this past legislative session. But, as you can tell, there is much more work to be done. Please keep this in mind during this campaign season and, if you are re-elected, during next year's legislative session. We are desperate for your help. We are fighting for our children the best we can, but we are battling a bureaucratic nightmare. Using test scores to judge teachers and our students is clearly wrought with errors at every turn. It's time to find a more effective, and much less emotionally traumatizing, manner of evaluation. "The reformers and appointed leaders speak often of holding teachers 'accountable' but yet they are not held accountable for the havoc they have forced upon our schools, teachers, and children. The TCAP test result delay is a perfect example. If the shoe were on the other foot, the TNDOE would not be merciful with teachers or Superintendents for a delay of TCAPs. In fact, one community even had a massive tornado hit them, but the TCAPs still went on for those students." You'll clearly see: The State Board of Education will get the incredible power to decide the Standards for our children. Yes, the same State Board of Education that voted, through a telephone conference call with dogs barking in the background, to revoke the licenses of teachers over test scores. The same State Board of Education that is APPOINTED and serves at the whim of the current administration. Tennessee citizens did not elect this board. This board does not answer to us. In fact, they won't return our messages. Two of them even unsubscribed from our emails. They don't want to hear from parents. They know who they serve and obey: Governor Haslam. As it seems right now, we are ALL being played right into the Governor's hands... parents, local school boards, Superintendents, legislators, and worst of all... our children. Legislators: when you go home tonight, exhausted after this Legislative session... will you be able to sleep soundly at night knowing you have sold out our children to corporate interests?